For more than 25 years, the CHOC Children’s Pulmonary Function Lab has been working with physicians to provide high-quality pulmonary function test results and educate patients and families on the vital tests they provide. The lab is one of very few pediatric labs to have achieved American Thoracic Society Accreditation. Our therapists also have their asthma educator certification (AE-C). Most importantly, our therapists specialize in working with children in order to get the very best test results possible. The Pulmonary Function Lab employs registered respiratory therapists (RRT) that also hold the credentials as certified and registered pulmonary function technologists (CPFT and RPFT). A pulmonary function test is also referred to as a PFT, pulmonary function studies or lung function studies. They provide important information about how well your child breathes. PFTs provide information that doctors can use to diagnose and follow certain lung disorders. PFTs are not invasive (do not go inside the body) and are not painful. “Pulmonary function tests” is an inclusive term that refers to a number of different procedures that measure lung function in different ways. These include spirometry, lung plethysmography, diffusion capacity and exercise challenge. 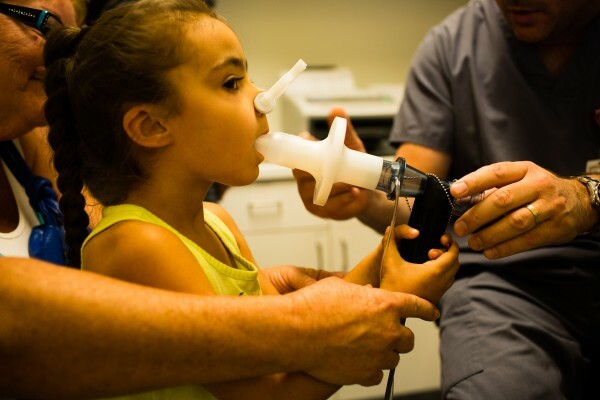 Spirometry – measures how well your child can move air in and out of their lungs. Lung plethysmography – measures the size of your child’s lungs. Diffusion capacity – measures how well oxygen passes from your child’s lungs into the blood. Exercise challenge testing – is able to determine if your child has exercise-induced asthma. 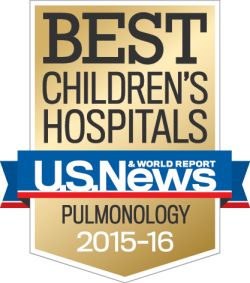 Why would my child need a pulmonary function test? There are many different reasons why PFTs may be ordered. They are sometimes ordered for healthy people as part of a routine physical. In others, the tests may be ordered when a specific illness is suspected. PFTs may be used to assess the lung function of patients prior to surgery or other invasive procedures in patients who have current lung and/or heart problems, who are smokers or who have other conditions that might be affected by surgery or other procedures. Another use of PFTs is the evaluation of treatment for conditions such as asthma, emphysema and other chronic lung problems. How old does my child need to be have a pulmonary function test? PFTs can be performed on children 5 years or older. The tests do not take a long time but the child needs to be able to follow clear, simple directions. Our staff is specially trained to work with children of all ages and carefully coaches each child to help ensure each test is as successful as possible. For children as young as 3 years of age, impulse oscillometry (IOS) can be performed to diagnose asthma. What are the risks associated with a pulmonary function test? Pulmonary function testing is not invasive (does not go in the body) and is safe for most children. The tests do not take a long time but the child needs to be able to follow clear, simple directions. Our staff is specially trained to work with children of all ages and carefully coach your child to help ensure each test is as successful as possible. What happens during a pulmonary function test? Pulmonary function tests may be done on an outpatient basis or as part of a stay in the hospital. 1. The child may be asked to loosen tight clothing, jewelry or other objects that may interfere with the procedure. 2. The child may be asked to empty his or her bladder before the procedure so that they are comfortable. 3. The child will sit in a chair or stand for the procedure. 4. The child will be given a soft nose clip to wear during the procedure so that all of his or her breaths will go through their mouth, rather than their nose. 5. The child will be given a sterile, filtered mouthpiece that will be attached to the spirometer. 6. With his or her mouth forming a tight seal around the mouthpiece, the child will be coached to perform various breathing maneuvers. The maneuvers will be done by inhaling and exhaling. Depending on what measurements are ordered, the child may be asked to repeat the maneuvers several times before the test is over. This will allow the child to practice and give their best effort. 7. In some cases, the child may be given a medicine called a bronchodilator after their initial tests. The tests are then repeated several minutes later after the bronchodilator has taken effect. This is called pre and post spirometry. 8. The child will be monitored carefully during the procedure for faintness, dizziness, difficulty breathing, increased heart rate or any other problems. 9. Tests results are monitored for acceptability and repeatability per American Thoracic Society standards. What happens after a pulmonary function test? Generally, there is no special type of care following PFTs. The child may resume his or her usual diet, medications and activities unless the doctor advises otherwise. PFT results will be evaluated and interpreted by a pulmonary physician specialist. This interpretation is then sent to the ordering physician. CHOC also provides cardiopulmonary exercise stress testing. This test is performed in conjunction with the cardiology department to determine if your child’s heart and lungs are working properly during exercise. The CHOC lab is one of very few pediatric labs to have achieved American Thoracic Society Accreditation. Our lab registered respiratory therapists (RRT) are credentialed as certified and registered pulmonary function technologists (CPFT and RPFT). Our therapists also have their asthma educator certification (AE-C). In addition to your child’s primary treatment, we offer our patients expert rehabilitation services, psychosocial support, the very latest integrative health services, and access to our Early Developmental Assessment Center (EDAC). We have the most comprehensive child life program in the region..